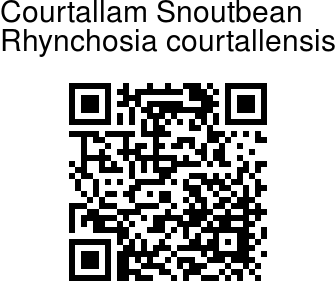 Courtallam Snoutbean is a climbing shrub,rusty woolly. Leaves are trifoliate with the end leaflet up to 10 x 8 cm, lateral 8 x 6 cm, oblique at base, rhomboid-ovate, tip tapering, base oblique, slightly heart-shaped; leaf-stalk to 5 cm, leaflet-stalk 0.3-2 cm, stipules and stipels linear, velvet-hairy. Flowers are borne in panicles in leaf-axils. 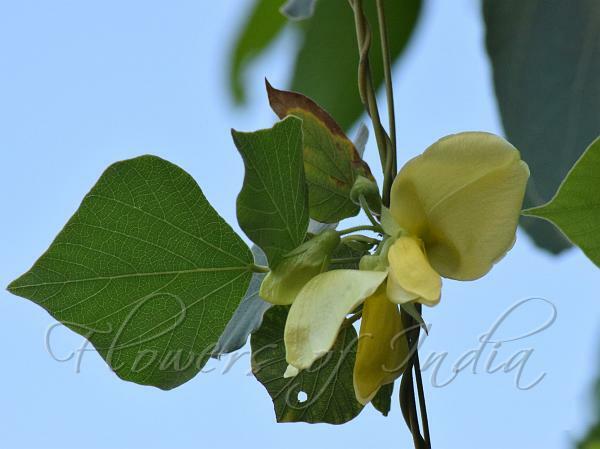 Flowers are yellow; flower-cluster-stalks up to 2 cm, velvet-hairy; calyx tube 7 mm, velvet-hairy, sepals 4 mm, triangular; standard petal 3 x 2 cm, round, eard; wings 2.5 x 1 cm, obliquely obovate; keels 2.5 x 1 cm, club-shaped; staminal sheath 2 cm, filaments 9 mm; anthers 1 mm; ovary 8 mm, ovules many, woolly, style 2 cm, hairy, stigma oblique. Pods are 4 x 1 cm, velvet-hairy, beaked. Courtallam Snoutbean is found in Peninsular India and Sri Lanka. Flowering: January-April.